Graduated: University of Texas Southwestern Medical School at Dallas with a Medical Degree in 1989. Residency: Obstetrics and Gynecology at George Washington Univ. Hospital in Washington, D.C. in 1989. Board Certified in Obstetrics and Gynecology from 1995 through 2005. Private Medical Practice in Atlanta, Georgia from 1993 to Dec. 2003. Specialized in Obstetrics & Gynecology, Gynecological Surgery, Laser Laparoscopy (esp. complicated cases), Menopausal Management, Hormone Replacement in Both Women and Men, Anti-Aging and Nutraceutical Medicine. Retired from Medical Practice in December 2003 to become full-time author, international speaker, and become independent sales associate with nutritional supplement company. Founded Medical Advisory Board for USANA Health Sciences, Inc. in 1998, and served on the Medical Advisory Board for more than 10 years. Medical consultant for PriceWaterhouseCoopers’ Partner’s Survival Clinic 1999 – 2001. Conducted Medical Research in both Cancer and Infertility. Published in medical journals, anti-aging medical books, authored several books, manuscripts, and produced audio recordings on the topic of nutraceutical and anti-aging medicine. Here is a small snapshot of the blog. Click on the graphic to see it full size. I have known and been associated with Dr. Ladd McNamara for over 12 years. We have worked together in the field of nutritional medicine making our patients and people aware of the health benefits of taking high-quality nutritional supplements. He has personally been an encouragement to me because of his passion, expertise, and professionalism in presenting the true scientific and medical facts in this truly emerging new field of medicine. I have listened to his lectures and read his books with great admiration and respect. He has certainly influenced my practice of nutritional medicine and I owe him a great debt of gratitude for his work and expertise as a leader in the field of nutritional medicine. Dr. Ladd McNamara is an excellent physician and specialist in obstetrics and gynecology. He has practiced his specialty with the utmost of integrity, professionalism, and expertise. I have personally visited with several of his patients who all have the deepest regard and respect for Dr. McNamara. He is truly unique in this era of allopathic medicine because he has taken the time to care and guide his patients into those healthy lifestyles that has allowed his patients to enjoy improved health and decreased dependence on medication. Dr. McNamara is certainly one of those fine physicians everyone would like to have had as their personal doctor. Could Mr. McNamara be more blatant in violating physician licensing rules? What exactly is it that you do, aside from point fingers at people? Anyone can do that. If you really want to make a difference, I’d suggest you stop blogging and look for a position where you have some legislative power – talk is cheap. Hi Michael – Thanks for asking about my career! I investigate fraud for a living. You know… non-doctors calling themselves M.D. CFOs of public companies falsely referring to themselves as CPAs. Public companies making false representations in SEC filings. It’s actually quite interesting, so I think I’ll stick with it for a while. If you’d like to learn more about fraud investigation and forensic accounting, I suggest you explore the rest of my website. I agree that he should not refer to himself as a doctor unless he is certified. However, that does not change the fact that he has been through all the training, experienced many things you or I will never experience, is an expert in his former field, and is qualified to give opinions – much like you or I. The medical facts he states are backed by clinical studies and personal experience and I highly respect him for that. I ran across this website when I googled Dr. McNamara to call him and catch up. I find this extremely interesting because Dr. McNamara did several operations on me that led up to me successfully having two children. He is a Saint in my book, and I really think you should take any opportunity to meet him personally and here what he has to say. With or without a license, I would trust him to operate on me!! Joy – You should probably consider yourself lucky. If he had his license yanked, I think it’s safe to say there are some other women who didn’t get so lucky. I am not sure why you find it necessary to practice defamation of character on this man. I am not associated with him in any way but I do know that when an individual spends 12 years of their life aquiring the schooling to be given the honor of being referred to as M.D. that has nothing to do with whether he is licensed in any of the 50 states. There are doctors from other countries that come here to study and still carry the M.D. after their name and they are certainly not licensed in any of the 50 states. The procedure is that you get the M.D. then you take a state test to get licensed. If Dr. McNamara (and I use doctor deliberately) either gave up his license or had his license removed for whatever purpose he still does not lose the M.D. status he has. He worked hard for that status and sacrificed a great deal to get it. You nor any media smear can ever take that away from him. You need to get your facts straight and find a life that doesn’t destroy someone elses. I am not one that believes in the “suit” happy trend this nation exhibits today but if I ever saw a reason for someone to get sued it would be people like you who take great pleasure in destroying someone elses life. How do you look at yourself in the mirror. After doing a LITTLE bit of research (I certainly wouldn’t spend much time on this nonsense) I discovered the man who started this media smear was paid handsomely for his role in the so called “fraud” investigation. He was an ex-con convicted of defrauding the public so he certainly doesn’t sound like someone I would want to be associated with. I wouldn’t call that a trustworthy character. Unfortunately, the laws of the State of California prohibit Mr. McNamara from referring to himself as M.D. or Dr. So if you have a problem with that, I would suggest that you write directly to the officials in California, because I don’t think they read this blog. I think I’ll play devils advocate in this. I know of someone now that gose around and tells people he has a Ph.D and I asked him one day now mind you he has had no formal training what so ever but he’s read every book and has done every online course available but that dose not make him a doctor. I have gone thru all the training I’am certified with E.P.A. and I still keep up with seminars and classes when they come up. Is that fair NO it’s not. I think what you do is very noble and please continue to un masked these frauds,someone mite get hurt or worse!!!! We need to remember regardless of what we say or do people are going to do and say and hurt what or who they want. I’m glad you are here to STOP it and STOP IT WE MUST. So Mr.McNamara doesn’t have a Ph.D. What would anything like that have anything to do with the legitimacy of Usana or it’s fine products? I can see that this site is nothing more than a slanderous gossip corner! and anyone in their right minds will stay far away from this web sight!! Life is too short to be wasted spinning wheels. and anyone who associates with and or quotes Barry Minkow is an extremely stupid individual! He is nothing more than a criminal and should be locked up! If you really think that you are making a difference within your mad little circle of friends then your are nothing more than criminal yourself! This is an important issue because the people associated with Usana have a history of lying. The executives themselves have been caught in many lies. So if people are willing to lie about their credentials, what else are they willing to lie about? That’s the whole point here. Dishonesty at the core. Definitely not a company I’d want to be associated with. Ladd McNamara has a Ph.D. That isn’t the issue. The man had his medical license stripped from him. He no longer has a license to practice! However, that does not stop him from claiming he is a medical doctor. Still to this day he claims he is a M.D. As far as not having a Ph.D., that was some of USANA’s other executives and directors. Most companies fire someone when they lied about their credentials. Not USANA however. Mark, Do you think it is okay for company executives to lie? 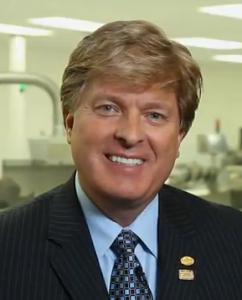 Here is emerald director Ladd McNamara’s USANA Distributor link where he still refers to himself as Ladd McNamara, M.D. After knowing that his license has been revoked, what gives him the right to continue calling himself a medical doctor?